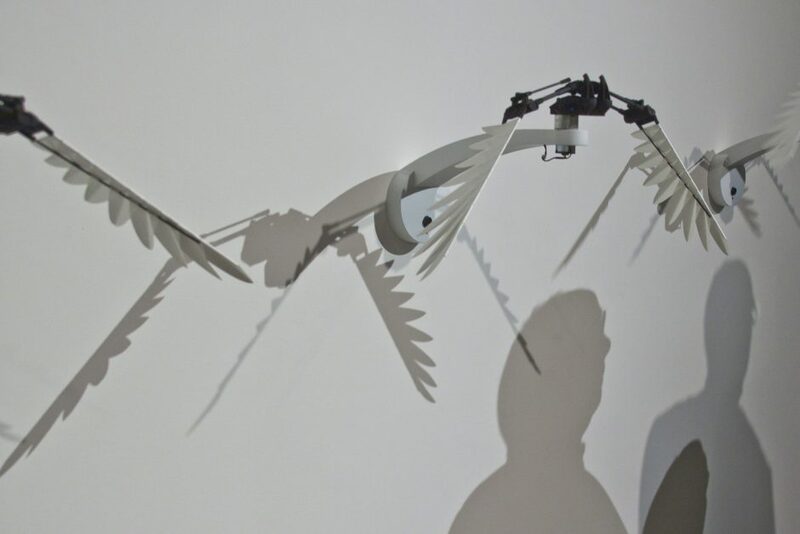 Mechanical wings connected to proximity sensors that when approached, gracefully flap as though trying to fly from their perches on the wall. They are assembled from machine-made parts that appear cold and high-tech, in contrast to the organic movements that they replicate. The piece is full of contradictions: at once inviting and intimidating, the tiny mechanisms and intricate design draw the viewer in for a closer look but their movement starts abruptly, startling the unprepared. Wings are typically symbols of freedom but these are secured to the wall, unable to take flight; a fact referenced by the title of the piece. These hybrids - part animal, part machine - are musings on the consequences of progress, a cyborg possibility. Nevertheless optimistic, this piece reminds viewers that though technology has the potential to be beautiful and produce awe, what we think will free us could also hold us down.